With the acquisition of the old Forest Park Hospital site, the St. Louis Zoo has transitioned from seclusion in Forest Park to an integral member of the urban fabric. As such, there is great opportunity to form new bonds with neighboring communities and evolve the Zoo’s mission. Since St. Louis and the Zoo are growing bioresearch programs, this development has the potential to elevate the growing industry. Great opportunity presents itself when considering the potential to explore environments where humans and animals coalesce. 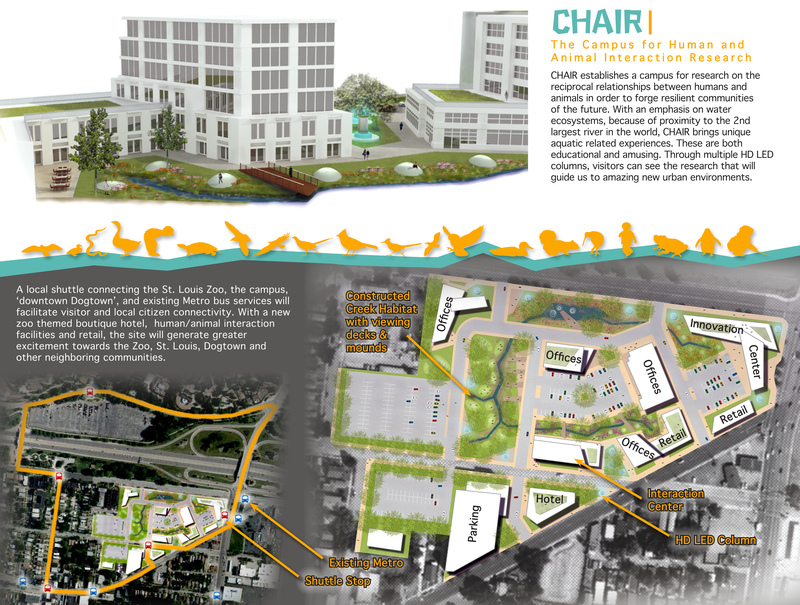 The CHAIR (The Campus for Human and Animal Interaction Research) concept establishes a complex for research on the reciprocal relationships between humans and animals in order to forge resilient communities of the future. With an emphasis on water ecosystems, due to of the location of St. Louis in one of the largest watersheds in the world, CHAIR brings unique aquatic related experiences. These are both educational and amusing. Through multiple HD LED columns, interactive exhibits and constructed habitats, visitors can see the research that will guide us to amazing new urban environments. In visiting the CHAIR campus, people can learn of need for interaction with animals and grasp roles needed to ensure coexistence with them in positive ways. The CHAIR concept envisions a new campus for the Zoo, while utilizing development patterns that strengthen urban form, provide new scientific and economic possibilities for the site and beyond, and build on surrounding infrastructure. A local shuttle connecting the St. Louis Zoo, the campus, ‘downtown Dogtown’, and existing Metro bus services will facilitate visitor and local citizen connectivity. With a new zoo themed boutique hotel, human/animal interaction facilities and retail, the site will generate greater excitement towards the Zoo, St. Louis, Dogtown and other neighboring communities. Such development prospects exemplify a strengthened relationship between the Zoo and communities both local and regional. Looking good. Would the creek flow through a pump or is there a local water source imagined? If the site were south of Manchester I’d be a big fan, but there I don’t know where the water would come from and I guess it’d be like a fancy fountain. Rework it to make the creek a rain garden for the whole site, and I’m a huge fan. If you could make that much sq footage hold its stormwater, it’d be great for the River des Peres. Otherwise, it’s a lot of surface lots that drain into the sewers. The idea for the creek is that it would have a pump to help water circulation and avoid stagnant water issues. But, it serves as a retention and infiltration center for water both on and off the site. So, it provides many of the processes of a rain garden, but acts on a larger scale. A major part of seeing how animals and humans can coalesce is to see how our stormwater runoff impacts the flora and fauna of the constructed habitat. While I agree that the pumps are not necessarily sustainable (and I wouldn’t normally advocate their use), I think this instance could be acceptable because it is all about research and innovation. The use of the pumps here can vary based on the scenarios that researchers want to emulate. Sometimes the pumps will be full throttle and other times they may be completely off. Beyond those thoughts and some others, I haven’t really worked out the details. I really hope people will help spur some ideas to evolve this thing.